The tiramisu is already receiving a warm reception from customers, with considerably long lines forming well into the afternoon on a weekend. 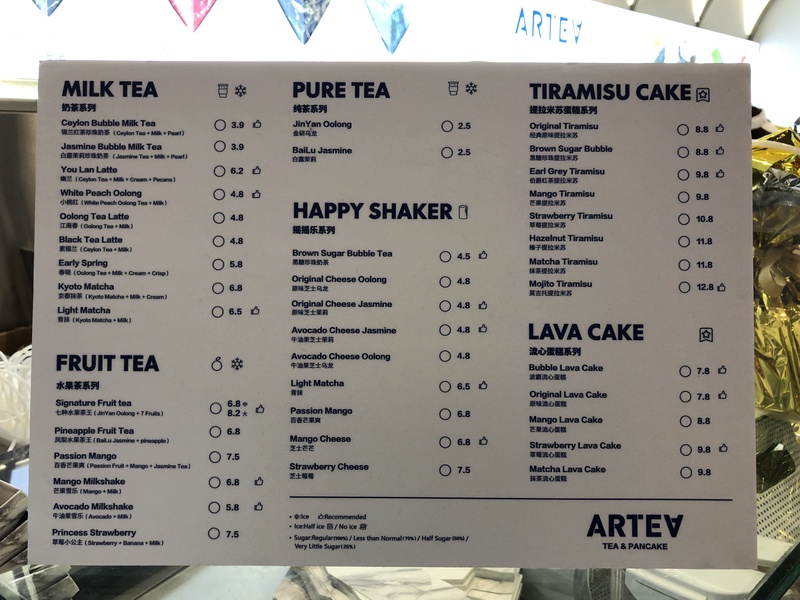 Takeaways for ARTEA’s dessert is just as fancy, with each box hand wrapped in gold foil paper and placed in a clear plastic bag for all to see your lavish indulgence. Our top picks include the Original Tiramisu, Earl Grey Tiramisu, and Matcha, which are rich and creamy. My personal favourite is the Matcha, whose deceptively simple presentation had me unprepared for its well balanced flavours. However, we could hardly make out the taste of mojito in the highest priced flavour, which also tasted more strongly of cheese. Fruity flavours like Strawberry and Mango provide that much needed refreshment amongst all that cream. Plus points for all those generous chunks of fruit in the tiramisu, too! While small, ARTEA’s tiramisu is rich enough that it can be shared with friends. Don’t forget to try some of their drinks, like the Signature Fruit Tea ($6.80 – $8.20), made with JinYang oolong and seven fruits! Another concoction that is worth trying is the ever popular Brown Sugar Bubble Tea ($4.50), which is mixed and packaged by machine in a unique, transparent can.